Archaeologists in Mexico say they have made an important discovery, uncovering a temple to Xipe Totec – the pre-Hispanic “Flayed lord”. Historically, throughout the region, priests paid tribute to the deity by wearing the skin of human sacrifices. Items relating to the deity were discovered at a site in Puebla state, and believed to date from 900-1150 AD. Mexican archaeologists say the find may be the earliest dedication to Xipe Totec discovered in Mexico. Worship of the God, who represents fertility and regeneration, is known to have later spread throughout Mesoamerica during Aztec times. The INAH say the 85cm (33in) ceramic effigy of the god was found in relatively good condition, though some parts are unattached. They say a right hand was hanging by his left arm, symbolising the skin of a sacrificed person hanging over him. “Sculpturally it is a very beautiful piece,” leading archaeologist Noemi Castillo said in a press release. Two large skulls, believed to be carved from imported volcanic stone and weighing about 200kg (440lb) each were also discovered. Archaeologists from INAH believe the skulls were used as covers for holes placed in front of two sacrificial altars where they believe sacrifices to him were buried. All of the materials discovered have been sent to laboratories for official registering and further analysis. Who was the ‘The Flayed one’? Xipe Totec is thought to have first appeared in the pre-Aztec era and is usually depicted in sandals, a loincloth and wearing the skin of human sacrifice. The festival of Tlacaxipehualiztli, which means to wear the skin of the skinning, was dedicated to him during spring during the Aztec period. It involved selected captives being sacrificed, sometimes by staged gladiatorial fights, before they were skinned and hearts cut out in homage of the God. Priests commemorating the festival then wore the skins during ceremonies in dedication. 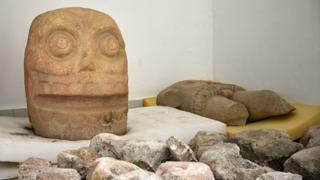 The archaeologists behind the find in Mexico believe the sculpture they found of him is the earliest ever recovered.